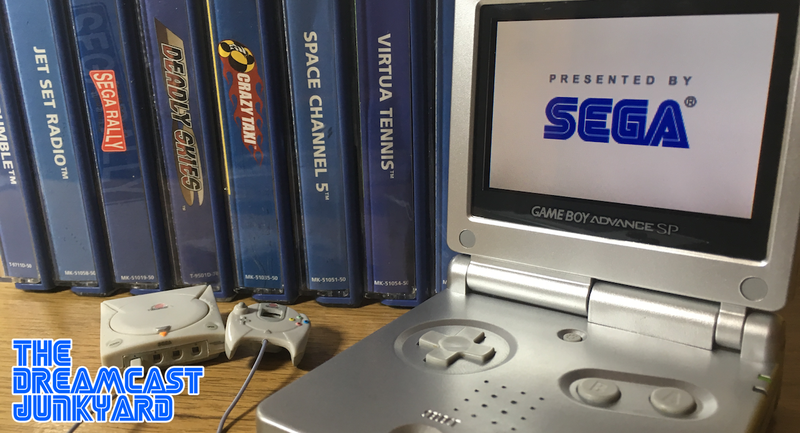 We recently took a look at the PS Vita, and more specifically some of the titles that are available for Sony’s sleek yet neglected handheld which have their roots on the Dreamcast. 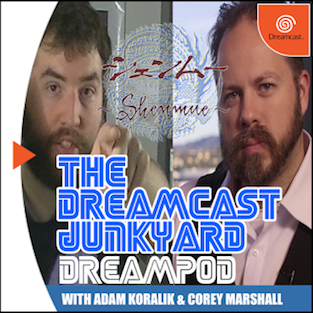 While many of the games in that article feature alterations and improvements over their originators, they all keep the same basic gameplay and – most importantly – allow a whole new generation of gamers to experience the magic of the Dreamcast. 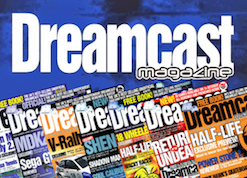 It’s true that many of us in the Dreamcast community take it for granted that we were there the first time around and got to experience the Dreamcast when it was new and exciting, and in a way the re-release of certain Dreamcast titles on contemporary platforms allows younger gamers the opportunity to enjoy what we felt back then. 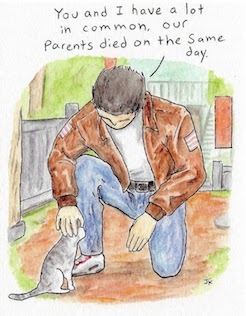 Probably why there’s so much call for Shenmue remasters…but that’s a whole different topic for another day. When I wrote about the PS Vita’s small but perfectly formed Dreamcast-derived library, I also mentioned my love for the Nintendo Game Boy Advance and here I will repeat what I iterated there: the Game Boy Advance SP is my favourite handheld of all time. While I do own a Game Boy Micro and an original Game Boy Advance, it is the SP (or more specifically the AGS 101 backlit model) which is my go-to handheld whenever I want a break from my Vita. For me, it is the greatest handheld ever crafted; there’s just something about that amazing screen, the pleasing form factor and the superlative library of ‘perfect for handheld’ first and third party games. That said, the Game Boy Advance is also a console that offers a multitude of titles that could be seen as extensions of games that first appeared on the Dreamcast. 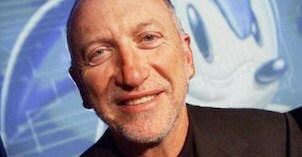 When you consider that the console was released into the immediate power vacuum after the Dreamcast’s demise (with the PS2, Gamecube and Xbox all circling over the corpse) it was a smart move on Sega’s part to allow IPs that were still fresh in most peoples’ minds to receive ports and spin offs on Nintendo’s seminal handheld - even if the majority of them weren't actually developed or published by Sega. The most intriguing aspect of this glut of semi-sequels and supplemental releases, is that a lot of them were so technically ambitious and eschewed the familiar 'top down' or 'side scrolling' approach usually afforded to similar releases on the Game Boy Color, for example. The game that kicked off online gaming on the Dreamcast, ChuChu Rocket! 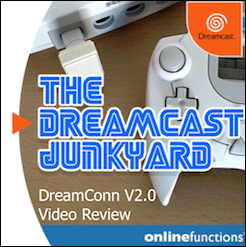 is a title that many a Dreamcast owner holds dear. The simplistic yet dazzlingly addictive nature of Sonic Team's seminal multiplayer-focussed mouse 'em up still hold up to this day - I put it on recently when I had some friends over and after the initial confusion over the controls we played it for hours, consumed many alcoholic beverages and had a total blast. 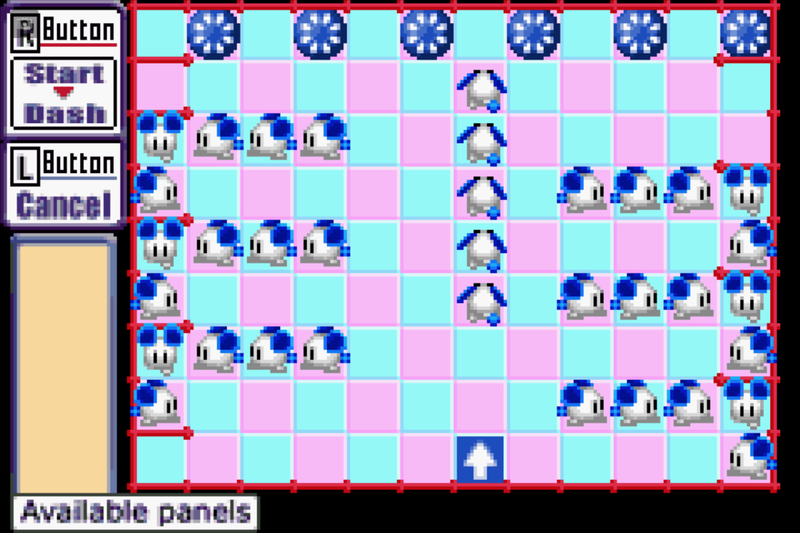 ChuChu Rocket!, despite its minimalist aesthetics and less-than-complex gameplay mechanics is a game that will - and has - transcend the ages. Online multiplayer was the main selling point on release, but even today the local multiplayer is every bit as awesome as it was back in those halcyon days of Dreamcast fever. The Game Boy Advance port of ChuChu Rocket! 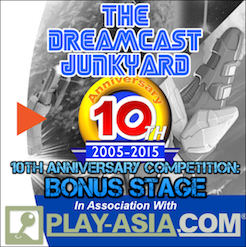 is a prime example of gameplay taking precedent over visuals, and while the Dreamcast game was primarily a vehicle for the proliferation of the console's online capabilities, this portable version takes the key components of the experience and distills them down into a ball-breaker of a single player puzzle game. That's not to say multiplayer is totally stripped out, as link cable gameplay is championed and up to four Game Boy Advance consoles can be linked from a single cartridge. However, the true emphasis here is placed on the puzzle elements of the single player experience...and it is sublime. ChuChu Rocket! was a launch title for the Game Boy Advance and it really showed what was capable with a link cable. However, even without multiple consoles it is the complete package. 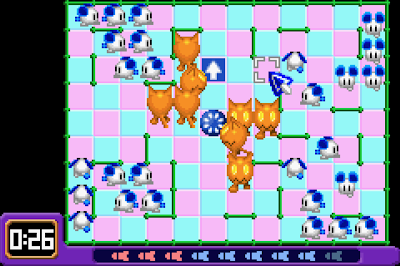 The gameplay remains intact and faithful, with players tasked with diverting huge numbers of mice into their rockets via a series of directional tiles laid down on the board. 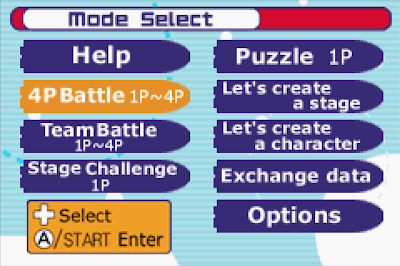 There is a standard 'battle' mode where you can compete against human adversaries, and also a challenge mode where you aren't allowed to let any of your mice get eaten; but the real star in this portable version is the puzzle mode. 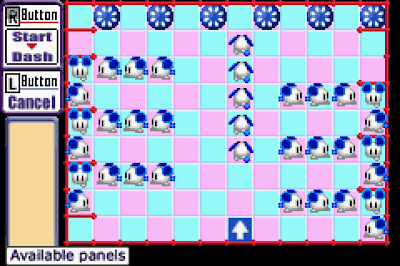 There are literally thousands of boards to play on (2600 in total - 100 standard and 2500 user-created ones), each with ever-increasingly difficult puzzles to solve with a limited number of direction tiles. 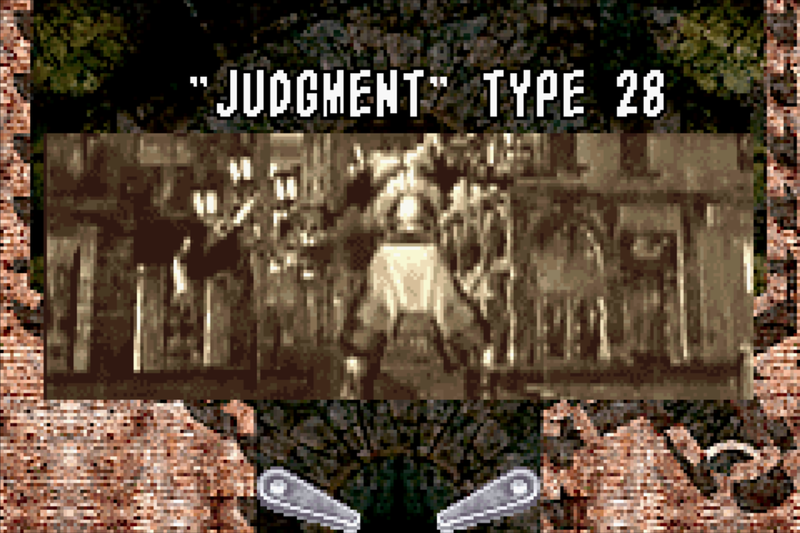 Visually, the GBA port does away with the polygonal models used in the Dreamcast version and replaces them with sprites, but it matters not one iota. The game runs and plays just as well as the Dreamcast version and is perfect for the Game Boy Advance. 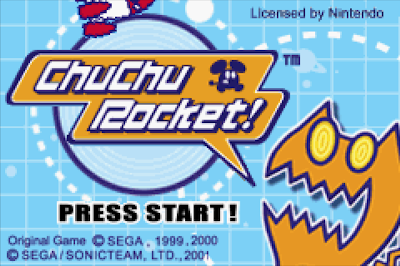 Do yourself a favour - if you own a Game Boy Advance then seek out a copy of ChuChu Rocket! 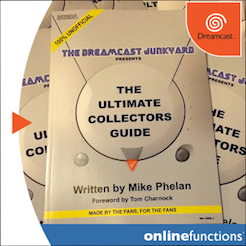 and witness a masterclass in how to turn a home console favourite into a portable extravaganza of awesomeness, even with the main online aspects removed. Simply sublime. Without a doubt one of the most highly rated and beloved of all the original IPs to come out of the Dreamcast era, Jet Set Radio is every bit as popular today as it was back in the early 2000s. The stunning mix of groundbreaking cel-shaded visuals, slick musical beats and engaging gameplay made Jet Set Radio an instant classic and the fan base is bigger now than it ever has been. Naturally, knowing it had a hit on its hands Sega was keen to exploit the popularity of the original and a sequel - Jet Set Radio Future graced the Xbox in 2002. Later in 2003 a portable version based on the original Dreamcast game hit the Game Boy Advance and it brought the funky, paint-soaked world of Tokyo-To to a whole new audience. 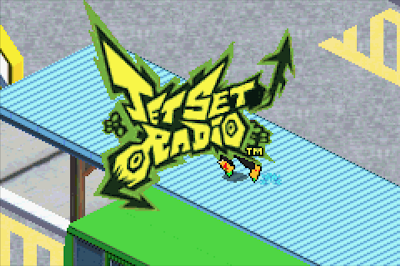 The conversion of Jet Set Radio (or Jet Grind Radio for our American friends, thanks to band Jet Set Satellite) was handled by Vicarious Visions, a studio with a great deal of experience creating games for Nintendo handhelds. Indeed, Vicarious Visions was also behind the portable versions of Tony Hawk's Pro Skater and so handing the conversion job to the New York-based studio seemed like a no-brainer. Taking more than a few cues from its previous portable skating titles, Vicarious Visions' re-imagining of Masayoshi Kikuchi's masterpiece transplants the action into an isometric approximation of Tokyo-To, with all of the familiar characters recreated as pre-rendered sprites. 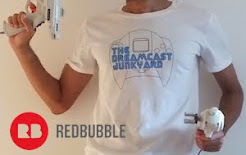 What's cool though, is that the aesthetic remains largely intact, even without the grunt of the Dreamcast. 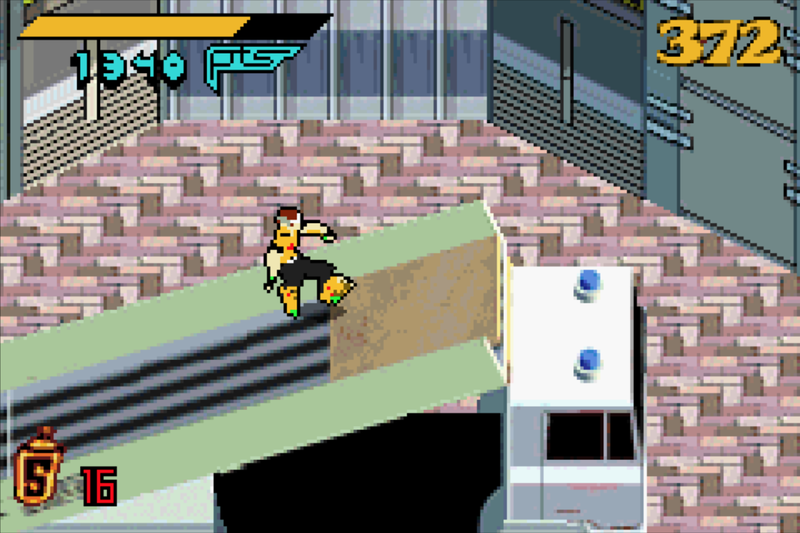 The stages you play in are all eerily faithful in layout and design to those seen in the Dreamcast game, wile the familiar gameplay also remains - collect paint cans, find the graffiti locations and escape from the clutches of Captain Onishima and his white-clad police goons. The lack of an analogue stick means graffiti controls are devolved into button presses, but for the most part Jet Set Radio on Game Boy Advance is startlingly faithful. The vast majority of the characters, story line and cut scene stills are all there, and the music (while down sampled and shortened) is also straight from the original soundtrack. 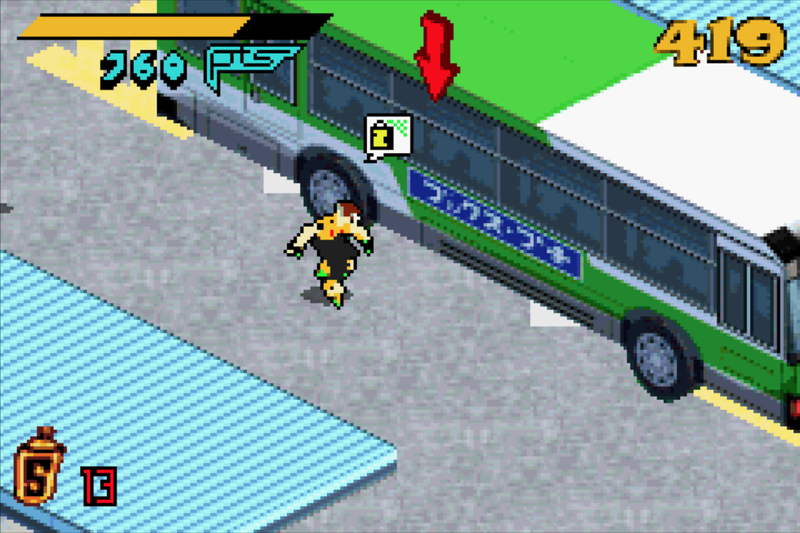 The overhead, isometric view can lead to some very confusing controls on occasion (up is always forward and the steering tends to be far more sensitive than you'd expect), but for the most part this is Jet Set Radio through and through...just on a smaller scale. Space-based uber reporter Ulala is perhaps the most iconic of the new wave of characters introduced by Sega during the Dreamcast era, but the series she featured in - Space Channel 5 - is quite divisive. People either love the rhythm-based 'Simon says' style gameplay; or they loathe it. I tend to fall into the latter category as I find the 'copy the sequence' style of play to be insanely monotonous. 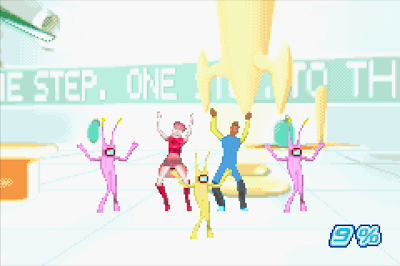 That said, I can still totally appreciate the retro-futuristic aesthetic United Game Artists created when Space Channel 5 hit the Dreamcast in 1999 and 2000 (depending on your location). The game basically tells the story of a band of invading aliens called Morolians, who intend to capture the population of Earth by turning them into dancing zombies. 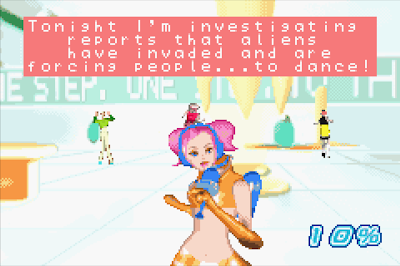 Ulala is tasked with defeating the Morolians and freeing the enslaved, endlessly dancing humans by matching their moves and utilising her ray gun through a number of stages. As stated, the gameplay amounts to little more than following the commands of the Morolians and tapping the direction pad and face buttons in time to the (admittedly awesome) music. Space Channel 5 proved to fairly popular on the Dreamcast and spawned a Japan-only sequel in Space Channel 5: Part 2 (which also came out on PlayStation 2), and was also included as part of 2011's Dreamcast Collection for PC and Xbox 360. 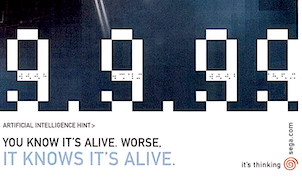 The Game Boy Advance port is in essence a paired down version of the original game, and relies on the same gameplay mechanics as the other two games, albeit with vastly reduced visual impact. The game was developed by Art Co., Ltd and published by Sega in Europe and THQ in North America, but oddly doesn't appear to have been released in Japan. I say oddly because Space Channel 5: Part 2 on the Dreamcast was (as mentioned) a Japanese exclusive, so you'd think there'd be a market for releasing a GBA version there too. 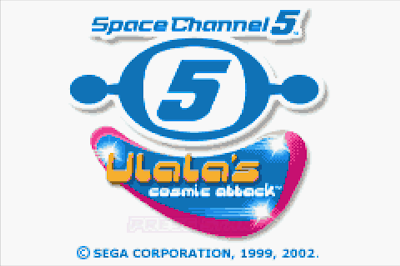 Naturally, due to the restraints of the Game Boy Advance hardware there are no polygons involved in Space Channel 5: Ulala's Cosmic Attack and instead the game uses pre-rendered sprites and 2D backgrounds. Even so, the game looks good and the animations are very faithful to the original game with Ulala in particular being very well drawn. The sound effects and music too appear to be taken straight from the home console version so it's very faithful aurally. However, the game doesn't really offer anything above and beyond pressing buttons in sequence and in time with the music. Which, if you're a fan of Space Channel 5, is what you'd expect. It's a decent miniaturisation of the series but if you weren't a fan of the originals there's not much here that will excite. 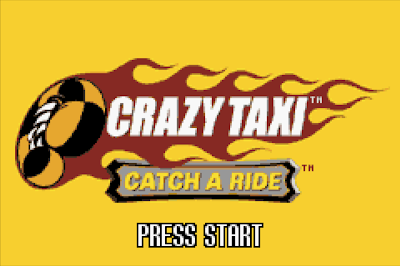 There are two ways you can look at Crazy Taxi: Catch a Ride. One is that it's a horrible mess which is about as faithful to Dreamcast Crazy Taxi as a Tracy Emin art installation is to reality; the other is that it's a pretty ambitious and technically impressive attempt to shoehorn a NAOMI arcade game onto a pocket-sized handheld boasting a fraction of the computational power. I tend to look at it - rightly or wrongly - with the latter opinion. 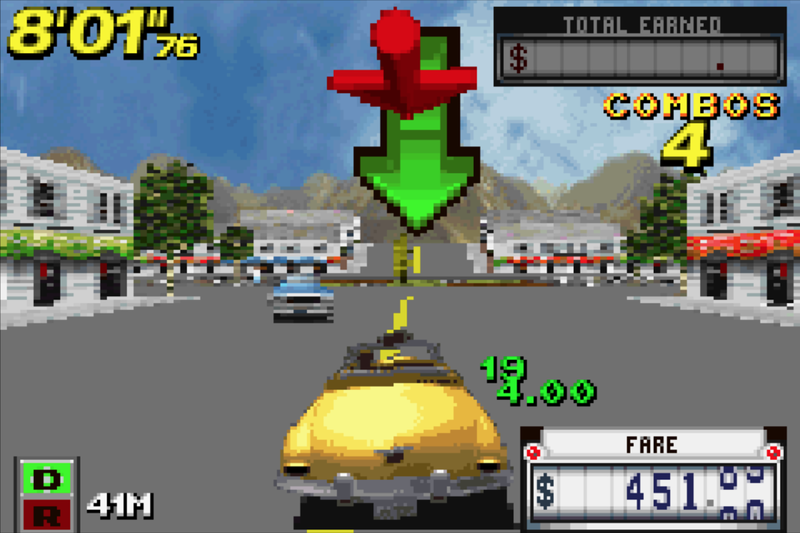 Crazy Taxi on the Game Boy Advance is hardly what you'd call arcade perfect, but what it does do is show just how much faith developer Graphic State had in the hardware on offer. From the off, the familiar intro screens and menus are on display. The over-enthusiastic voice over, the game modes and even the Crazy Box mini games are all present and correct. Starting the game, you'll instantly recognise the coastal city of Crazy Taxi and it's actually quite eery how well all the locations you know and love are recreated on a tiny screen with zero draw distance, comparatively empty streets and heavy pixellation. Oh, and naturally the Offspring's trademark tunes are no longer involved but the substitute music is perfectly acceptable. 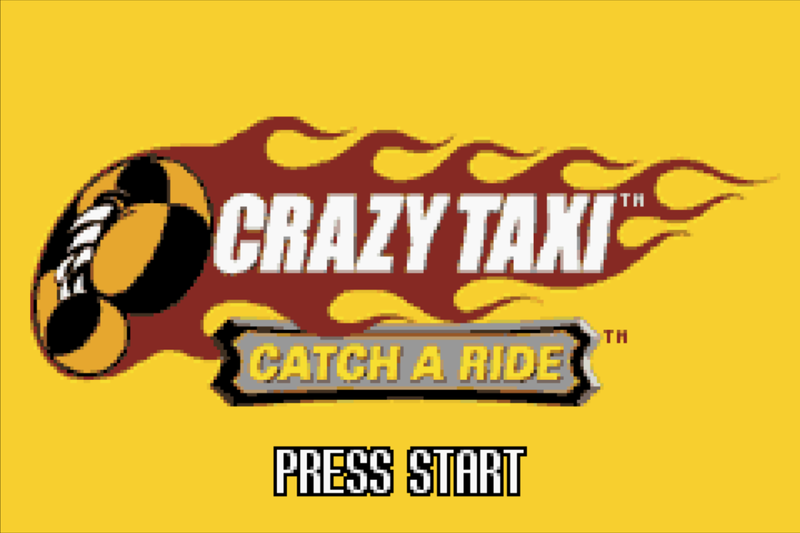 Driving around for a while in the world of Crazy Taxi: Catch a Ride is a bit weird to be honest. It's like a really bad photocopy of Crazy Taxi...that has been photocopied another 100 times and then faxed across the world and then somehow rendered on an Etch-A-Sketch. OK, I'm exaggerating slightly...buy you get the idea. It's Crazy Taxi, right down to the familiar sound bites of the passengers you pick up and the drivers you play as (the four original cast members are here, along with their familiar vehicles), but it just feels like an odd imitation. The visuals are so low res and the draw distance so poor that it's almost a chore to play, and trying to avoid oncoming traffic that just appears in front of you is almost impossible. 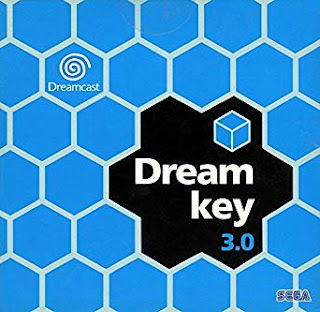 However, the sheer fact that a port like this even exists on a platform like the Game Boy Advance can't help but be endearing to anyone who played the Dreamcast version as much as I did back in the day. The familiar districts and landmarks are there, the aforementioned Crazy Box mode is ready and willing to let you try your luck in pretty much all of the mini-games you've played in the console version. The gameplay is almost there too, although due to the technical limitations of the hardware corners have been cut extensively. 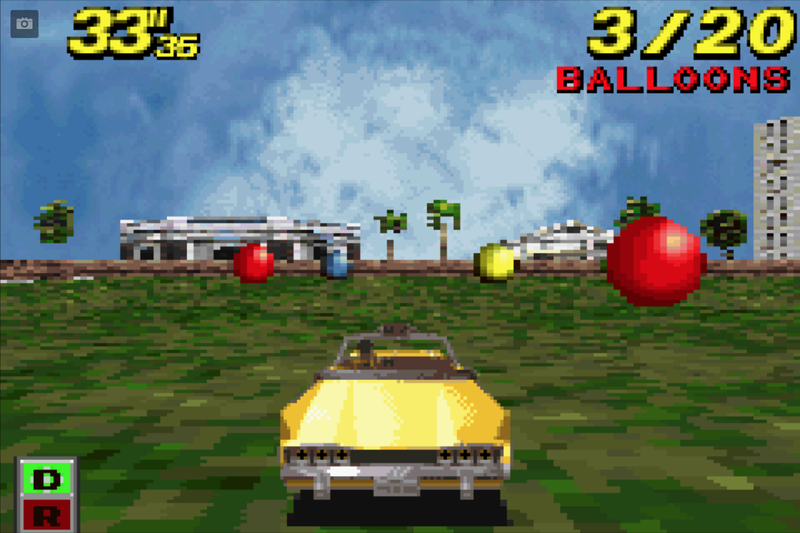 It runs well (if a little slowly), and really when all is said and done it's about as close to a handheld Crazy Taxi as you could probably hope for on this platform at the time of release. It isn't perfect by a long chalk and there are lots of issues with speed and collision detection, but as an specimen of ambition outstripping hardware or technical ability Crazy Taxi: Catch a Ride stands out as a shining example. Sega Rally Championship for the Game Boy Advance isn't a direct port of a Dreamcast game, but I thought it was worthy of inclusion in this article simply because it does take some design cues from the Dreamcast version of Sega Rally 2. 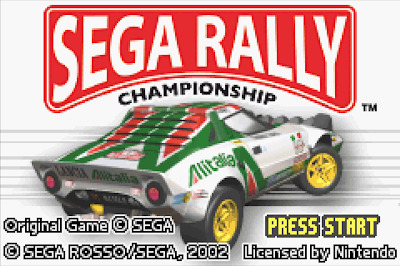 It's also technically the third game in the series, coming as it did in the aftermath of the Dreamcast's demise, but three years before Sega Rally 2006 hit the PlayStation 2. 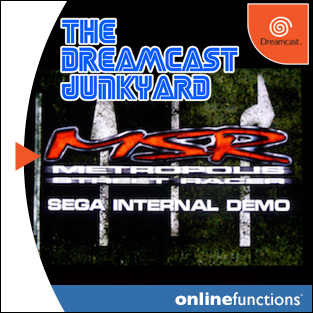 This handheld recreation of the arcade racing favourite was developed by Sega Rosso, an internal studio which was also responsible for some fairly high profile Dreamcast games, including Virtua Tennis, Crazy Taxi 2 and the mythical Segagaga. That said, even with this calibre Sega Rally Championship for the Game Boy Advance is something of a mixed bag. 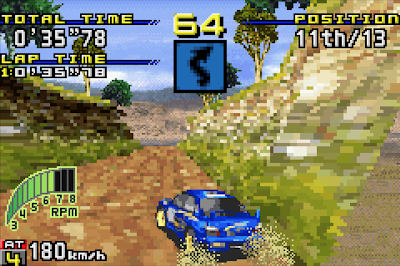 There is a clear nod to the Dreamcast's Sega Rally 2 when it comes to the layout of the options menus and the graphical interface the player must navigate in order to get out on to the stages, but that's where the similarities end for the most part. 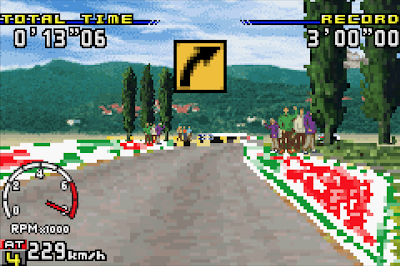 The game itself actually looks fairly bad - even by Game Boy Advance standards, and there are other rally titles on the platform that make Sega Rosso's effort look archaic in comparison. 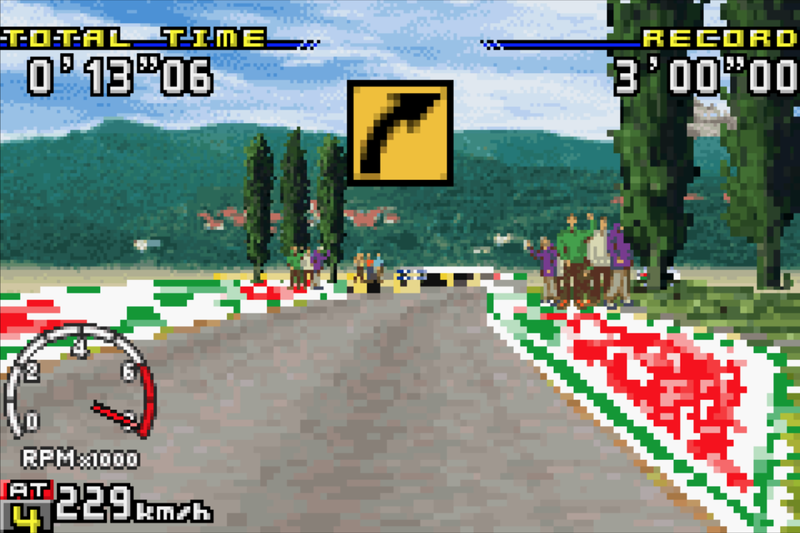 The graphics are very low res and the engine is full of graphical glitches such as trees popping through scenery and foreground trackside scenery disappearing before it has even left the field of view. 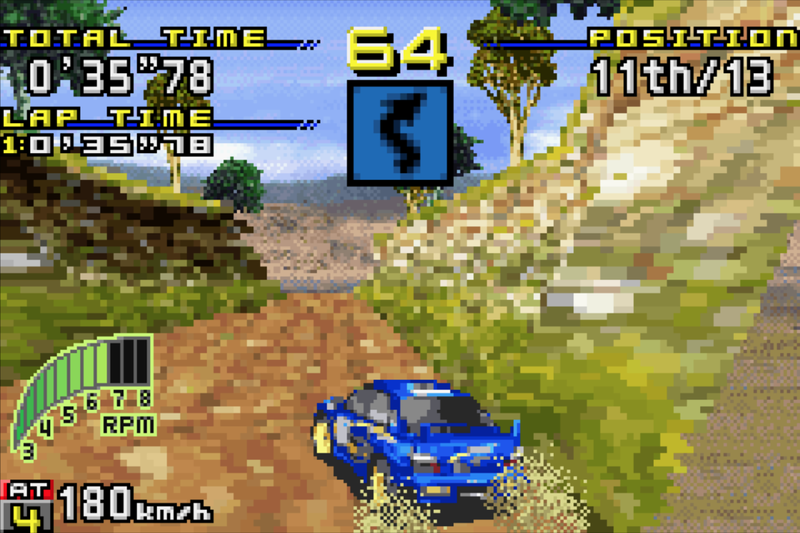 One look at V-Rally 3 for GBA will illustrate just how amateurish Sega Rally looks in motion. Gameplay too is lacking, with the vehicles appearing to turn on the spot - the familiar inertia-based physics of the home console versions of Sega Rally all but forgotten. 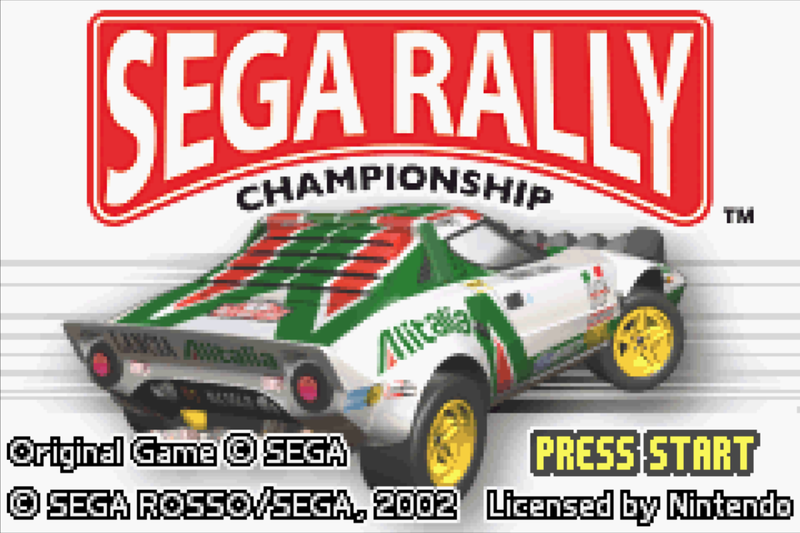 Maybe that comes across as a little harsh, but other rally games on this platform manage to afford vehicles with a degree of weight and physical presence (Colin McRae 2.0 and Top Gear Rally are prime examples), so quite how Sega Rosso messed this up is beyond me. It does play slightly better if you select the bonnet cam view that's hidden away in the options menu, but its a case of too little too late. As ever, all of this is simply the opinion of one gamer (me), so you may well get more enjoyment out of Sega Rally Championship if you are less obsessive about rally physics and visual quality. The one aspect of Sega Rally that will please any gamer though, is the number of championships and unlockables on offer. 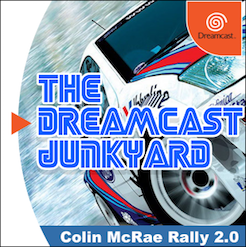 There is no 10 year championship as seen in the Dreamcast game, but there are a plethora of different modes and an impressive roster of real rally cars to try out. Just don't go into Sega Rally Championship with high hopes and you may eek some enjoyment out of it. The Game Boy Advance port of Virtua Tennis is something of an oddity, as even though it is simply named Virtua Tennis it actually plays more like a handheld Virtua Tennis 2/Tennis 2k2. Interestingly, the game features the Williams sisters and therefore both male and female athletes, but only Serena and Venus are real world players. The rest of the roster is made up of fictional characters from various countries, all blessed with the familiar strengths and weaknesses afforded by the series. In all honesty, it doesn't detract at all from the overall experience one iota, and one can only speculate that while the Williams sisters were still under contract from their appearance in Virtua Tennis 2, none of the other real world players were. 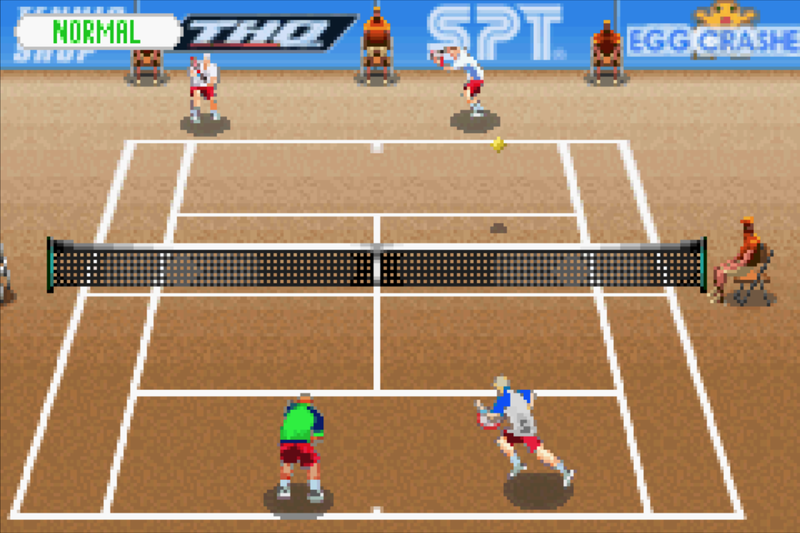 This is all academic though, as once you start playing the game proper, the small sprites don't really look anything like real people so you'll barely notice if you're playing as Tim Henman or Tennis McTennisface. The true appeal of Virtua Tennis on Game Boy Advance is its playability and accurate miniaturisation of the home console and arcade versions. 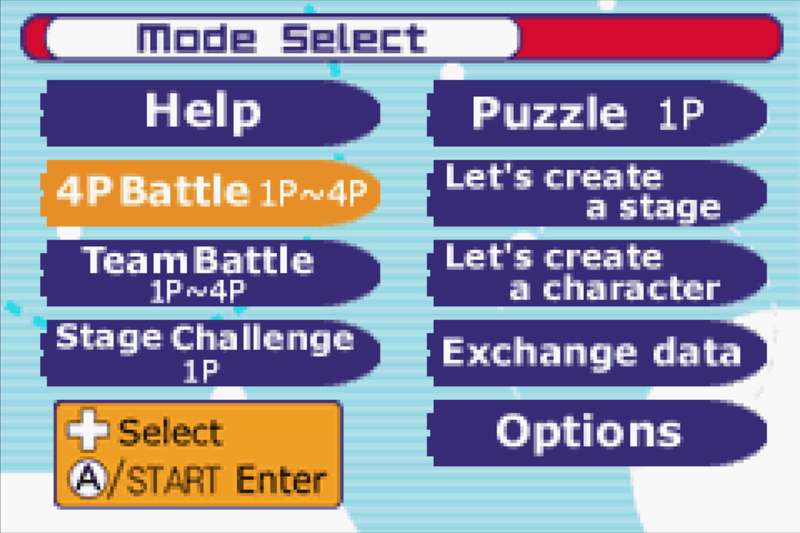 Again, anyone who has ever played the Dreamcast (or any other) port of Virtua Tennis will be instantly familiar with the look and feel of the menus, the gameplay modes and the way the game feels to play. The substitution of sprites in place of polygonal character models does nothing to detract from the overall gameplay in GBA Virtua Tennis and while the animations and range of different types of shots is reduced, the game plays every bit as well as you'd expect a portable Virtua Tennis from 2002 to play. You could even go as far as saying that even though it was co-developed by Sega and Altron, overseen by Hitmaker and then published by THQ, Virtua Tennis is proof that too many chefs do not necessarily spoil the broth. The game boasts both singles and doubles play, but also a full world tour mode complete with loads of crazy mini games and tournaments to enter and also a GBA system link option for multiplayer action. 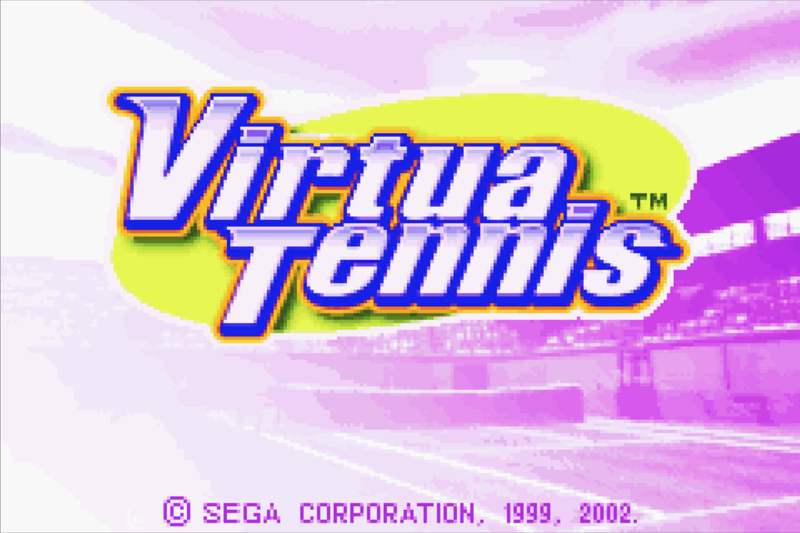 Virtua Tennis for the Game Boy Advance is a brilliant downscaling of a brilliant Dreamcast game and well worth playing if you get the chance. Considering Sega's The House of the Dead series is made up are arcade light gun games, they've spawned some pretty ingenious spinoffs. 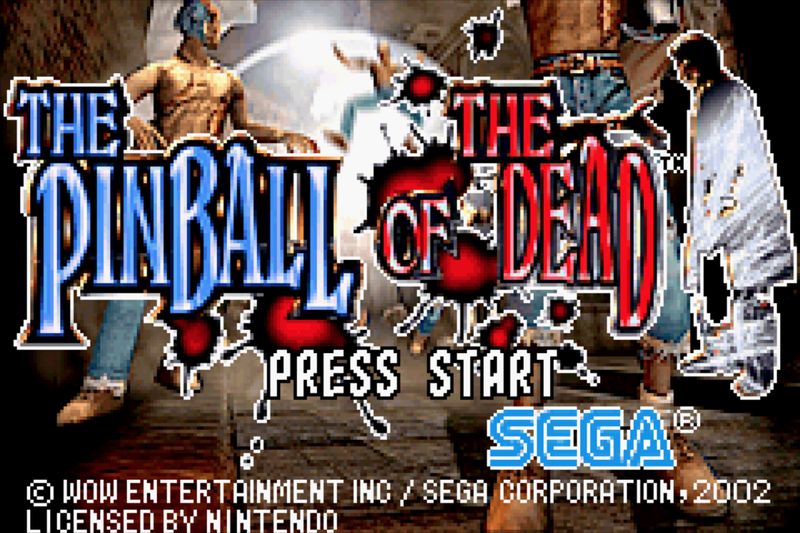 First there was the awesome Typing of the Dead and that was followed up by possibly one of the best pinball games on the Game Boy Advance with The Pinball of the Dead. As you can no doubt tell from the title and screens here, The Pinball of the Dead is a pinball game based on locations and events from the first two The House of the Dead games. While the series wasn't exclusive to the Dreamcast, this pinball game borrows heavily from the second in the series and the references are fantastically well done. 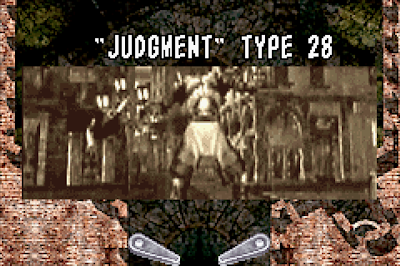 From the opening movie which shows scenes from The House of the Dead 2, to the menu music and even the overall feel of the menus this makes no attempt to hide the connection to the rest of the franchise. Developed by Wow Entertainment (a studio not unfamiliar with horror games), The Pinball of the Dead was published by Sega in Japan and North America in 2002. There are three tables to choose from and they are all modelled after locations and scenes from the first two main games in the light gun series. Titled 'Wandering,' 'Movement' and 'Cemetery,' each of the tables has multiple smaller areas which are filled with wondering zombies and other beasts (all of which will be familiar if you've played the main games) and are literally stuffed with nice references and nods. There are even boss areas that feature familiar undead beasts from the main games all of which need to be taken down with well placed pinballs. Another nice touch is the way each stage is preceded by a sort of quick time event where you get to shoot a zombie or some other foe using an auto-aiming reticle. If you hit the bad guy, you get a nice bonus for that round. 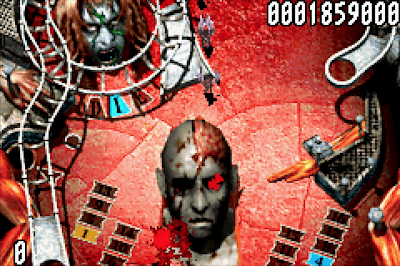 There are a couple of modes of play and lots of options to tinker with - from ball speed to blood colour, and no expense has been spared trying to make The Pinball of the Dead feel every bit as authentic as any of the other entries in the series - even the music is a faithful homage to the score from earlier games, while there are plenty of familiar sound effects and voice samples. In summary, The Pinball of the Dead is an utterly brilliant homage to the main series of light gun games and takes the franchise in a refreshingly original new direction. 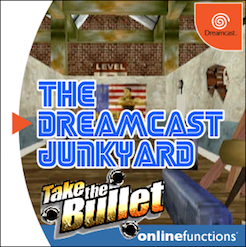 Obviously a light gun game wouldn't have been possible on the Game Boy Advance (although it is possible on a Game Gear), so pasting the subject matter into a pinball game was a masterstroke. Highly recommended if you can find it. None of the following games are based on titles that were Dreamcast exclusive, however they are - to me at least - intrinsically linked to the Dreamcast. 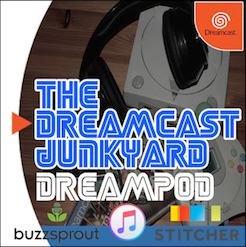 The number of games that had ports on both the Dreamcast and GBA is extensive but in this bonus section I thought it would be cool to look at a few GBA games that many people still associate with the Dreamcast over and above any other home console. The popular arcade game received a port to most home consoles, but Konami's Silent Scope is perhaps best remembered as a Dreamcast game. 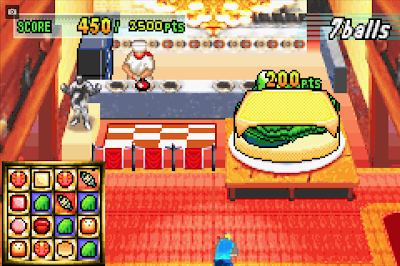 The Game Boy Advance version pretty much mimics the others but replaces the polygonal game world with static pre-rendered backgrounds and the enemies are all sprites. It actually works surprisingly well on the Game Boy Advance and most of the environments and options are reproduced accurately enough. 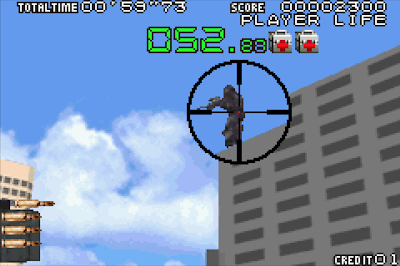 The sniper rifle's sights offer a zoomed view of proceedings so you're able to pop caps in bad guys and the targeting reticle once zoomed out allows you to quickly cycle between targets. 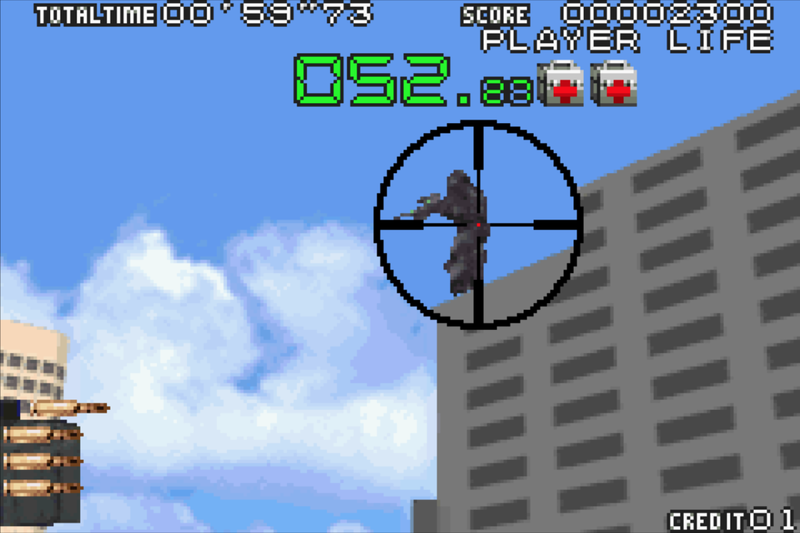 Most of the stages and shooting galleries are included, as are the familiar boss battles (shooting a Harrier jet with a sniper rifle will never, ever get old) and the game also features an intriguing link mode. Silent Scope for Game Boy Advance is a decent attempt at putting a fairly intense arcade experience on a portable system, even without the fully 3D game world and special effects seen in other versions. 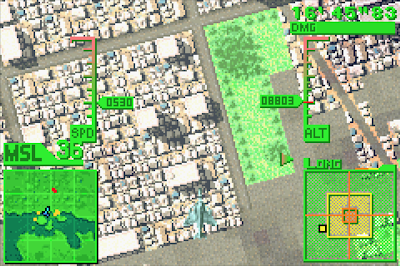 Another release from Konami, Deadly Skies/Air Force Delta for the Game Boy Advance takes cues from the Dreamcast title but tailors the experience to Nintendo's hardware. 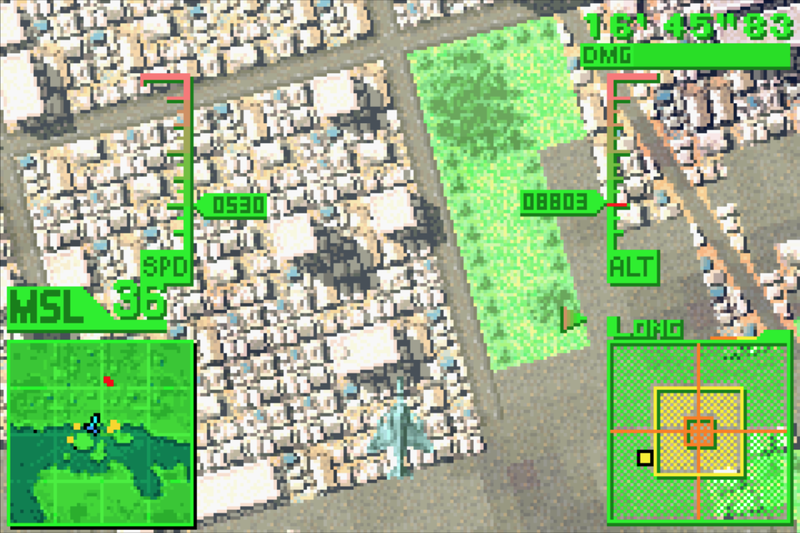 Unlike the Dreamcast game, Deadly Skies for Game Boy Advance is played from a top down perspective and is a much simpler game. You do have control over the altitude of the jet, and when you dive beneath the clouds the camera follows, giving a good view of the terrain and ground based targets, which is a nice touch. 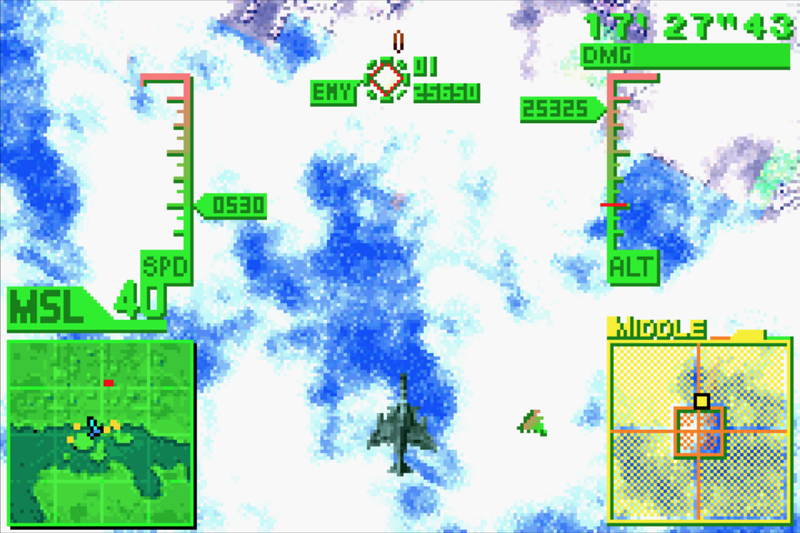 However, because the field of view around the plane is quite limited, you tend to rely almost exclusively on your radar display to tell you where enemies are, and where your next objective is. It does employ a lot of the same features seen in its bigger brother on the Dreamcast - you need to buy new planes with cash earned in missions and you can change up weapon load outs depending on the type of mission. All in all, Deadly Skies for Game Boy Advance is a bit of an acquired taste but if you're a fan of the series then this could be worth investigating. 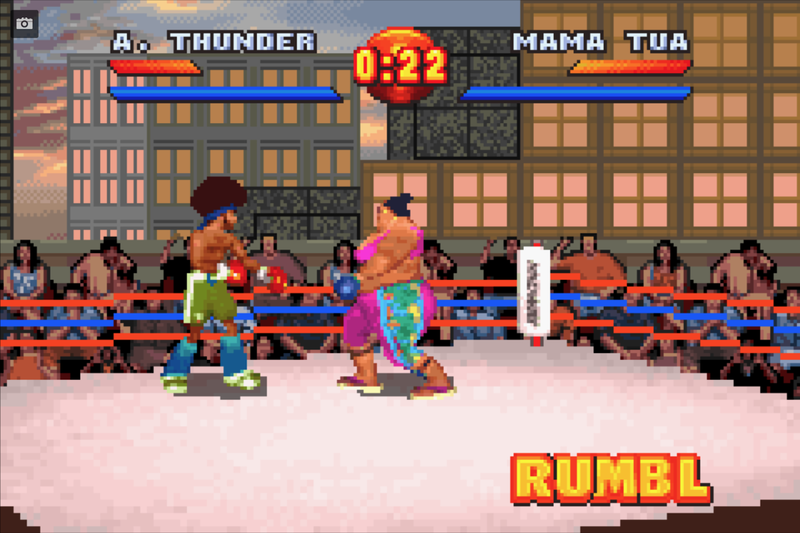 Even though it was later ported to the PlayStation, Ready 2 Rumble was an iconic release for the Dreamcast back in 1999; and the 2001 sequel Ready 2 Rumble: Round 2 came to pretty much every format on the market - including the Game Boy Advance. The port was handled by now defunct London-based Crawfish Interactive and it's actually quite impressive from a technical standpoint. 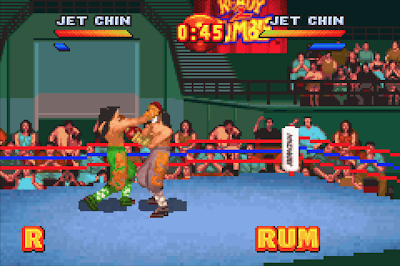 As with many of the games listed here, polygons are out and pre-rendered sprites are in, although the ring in Ready 2 Rumble: Round 2 uses a pseudo Mode 7 effect which allows the boxers to move around a rotating environment. One thing that isn't so impressive is the number of moves each boxer has at their disposal - they are vastly scaled back from the other home console versions and the reaction time between hitting a button and seeing the punch delivered is a little slow. 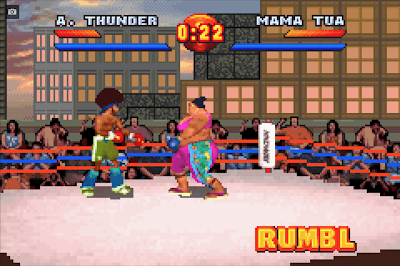 That aside though, Ready 2 Rumble: Round 2 is a good looking game and recreates the home versions well. There is a reduced roster of pugilists and arenas to fight in, but Micheal Buffer's trademark catchphrase is included so there's that. Not bad, but not amazing either; this is certainly worth a look if you're a fan. There are plenty of other games that also made appearances on both the Dreamcast and the Game Boy Advance, but for me these are the ones that stand out from the crowd. 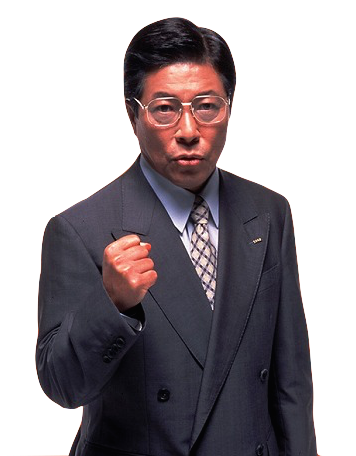 They vary wildly in terms of quality, but for the most part Sega seems to have made the right choices when passing development duties to external teams. Anyway, that's enough from me - what do you think? Did I miss any glaringly obvious Dreamcast-originated games that eventually made their way to the Game Boy Advance? Let us know in the comments or join the discussion in our Facebook group here. I would argue that before going to the GBA you should consider the PSP as most the reason why the Vita is a good portable Dreamcast is because the PSP was a good portable Dreamcast. Yeah, I was planning on doing a series of these types of article. Although my motivation is on the wane right now so it might have to wait! Nice. 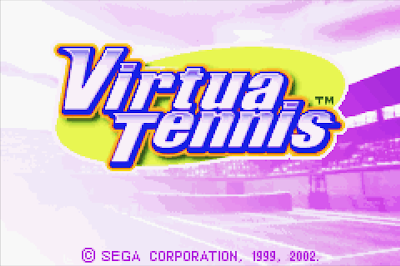 Totally forgot virtua tennis was on gba. Damn you and your click bait title getting me all excited!